Vasco Nunez de Balboa, a Spanish conquistador and explorer, was the first European to see the eastern part of the Pacific Ocean in 1513 after crossing the Isthmus of Panama. Balboa was born in Jerez de los Caballeros, Spain to the nobleman, Nuño Arias de Balboa and Lady de Badajoz in about 1475. Little is known of his early childhood except that he was the third of four boys in his family. During his adolescence, he served as a page and squire to Don Pedro de Portocarrero, Lord of Moguer. Motivated by his master, after the news of Christopher Columbus‘ voyages to the New World became known, he decided to embark on his first voyage to the Americas, along with Juan de la Cosa, on Rodrigo de Bastidas’ expedition. Bastidas had a license to bring back treasure for the king and queen while keeping four-fifths for himself. In 1501, he crossed the Caribbean coasts from the east of Panama along the Colombian coast, and through the Gulf of Uraba toward Cabo de la Vela. The expedition continued to explore northeast of South America until they realized they did not have enough men and sailed to the Carribean Island of Hispaniola. In 1510, Balboa and his dog, Leoncico, stowed away on a boat going from Santo Domingo to San Sebastian. When they arrived at San Sebastian, they discovered that it had been burned to the ground. Balboa convinced the others to travel southwest with him to a spot he had seen on his earlier expedition. In 1511, Balboa founded a colony, the first European settlement in South America – the town of Santa Maria de la Antigua del Darien in present-day Panama. He soon married the daughter of Careta, the local Indian chief. Soon after, in 1513, he sailed with hundreds of Spaniards and Indians across the Gulf of Uraba to the Darien Peninsula. Balboa and his men, including Francisco Pizarro, then traveled to the ocean, claiming it and all the that touched it for Spain. Once they reached the Pacific Ocean, Balboa and his men found gold and pearls, which Balboa decided to send back to the King Ferdinand of Spain. 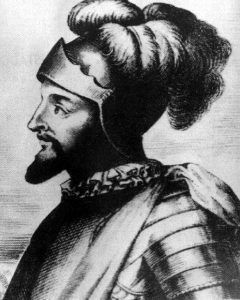 However, before news of Balboa’s accomplishment reached Spain, King Ferdinand appointed an elderly nobleman named Pedrarias Davila to be the new governor of Darien. Once the King learned of Balboa’s discovery of the Pacific Ocean, he appointed Balboa to serve under Davila as governor of Panama. Unfortunately for Balboa, Pedrarias Davila was a jealous man who did not like seeing the growing popularity and influence which Balboa was developing. In 1518, Governor Davila falsely accused Balboa of treason, had him arrested, ordered a speedy trial, and sentenced Balboa to death. In January 1519, Balboa and four friends were beheaded. Compiled by Kathy Weiser-Alexander, June 2018.